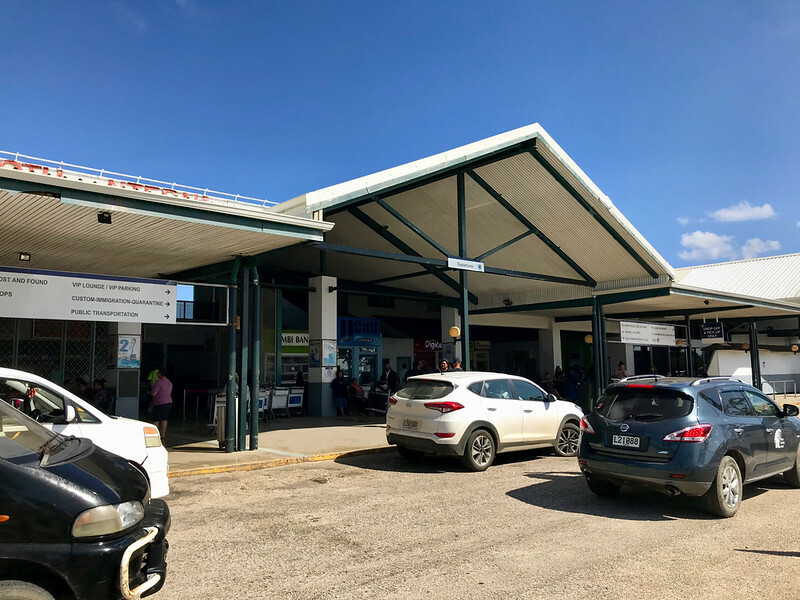 After spending 40 hours traveling one-way to get to Tuvalu, I’m now off to the sixth stop on the Domain Island Tour, the Kingdom of Tonga. 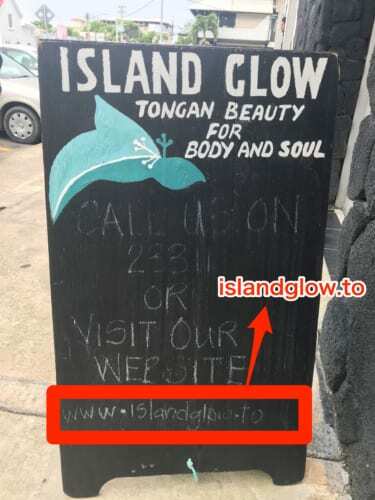 The ccTLD (country code top level domain) for Tonga is “.to”. ◆Where is the Kingdom of Tonga? 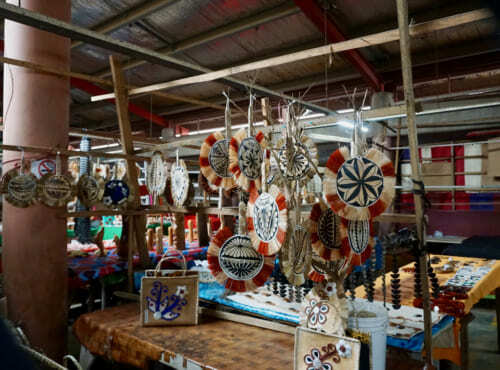 A nation made up of about 170 islands floating in the South Pacific, the Kingdom of Tonga is part of the Polynesian region of Oceania. 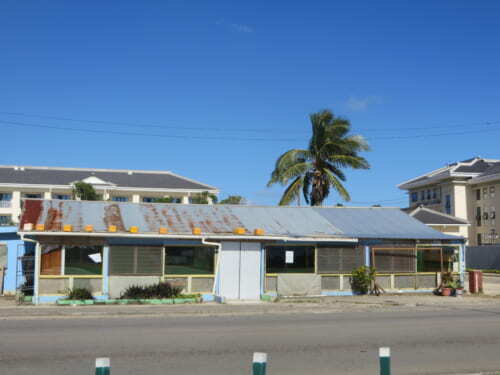 The capital city Nuku’alofa is on the largest island of the Kingdom of Tonga (hereafter: Tonga.) 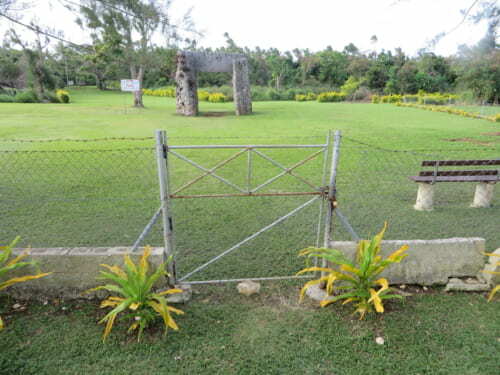 This time I visited Tongatapu, the largest island. 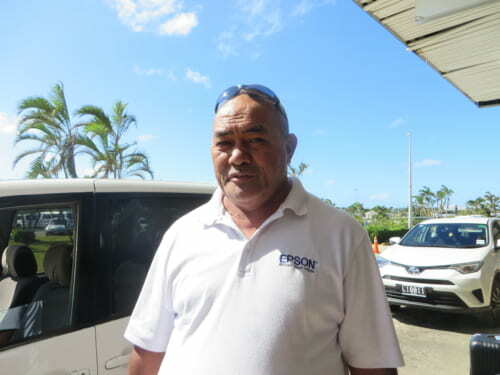 ◆A Tour of Tonga with Mr. Lata and Family! 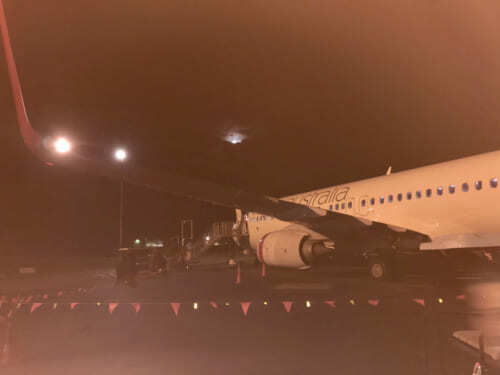 I arrived at Fua’amotu International Airport, which is about a 15-hour flight from Japan. The local time was past 7:00 pm. After deplaning, I walked to customs and immigration. 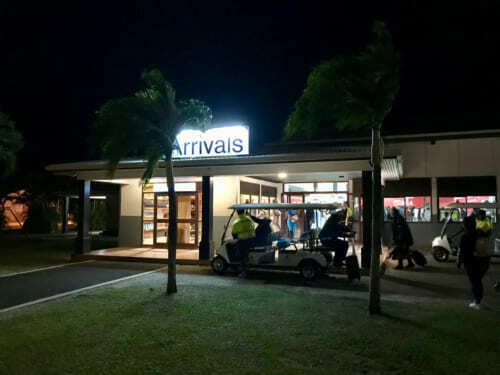 The arrival gate looks like a golf clubhouse. 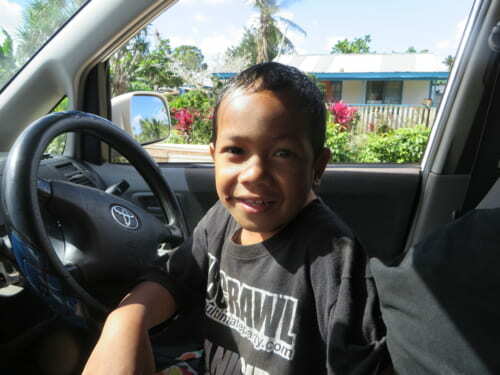 After finishing up with immigration, I took a taxi to the capital city of Nuku’alofa, about 40 minutes away. 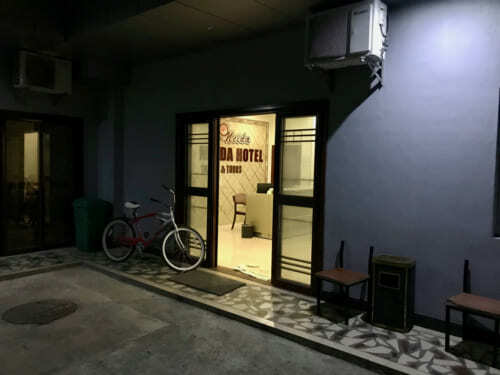 By the time I arrived at the hotel, it was getting to be nighttime, so I went to bed. The next day, the weather was good. I decide to go sightseeing right away. 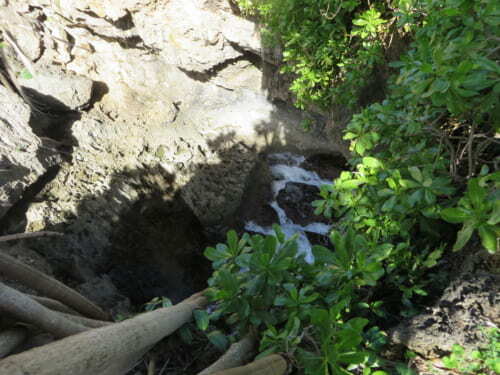 About 30 minutes from Nuku’alofa by car, I arrived at the southern coast of the island. Although I could hear the sound of the ocean, all I could see was a field. Going through the maze of green, suddenly a “hole” appeared in front of us. It had a diameter of about ten meters. Looking straight down into it was terrifying. It was very deep and there seemed to be water at the bottom. The whole picture. This is the Hufangalupe scenic spot. 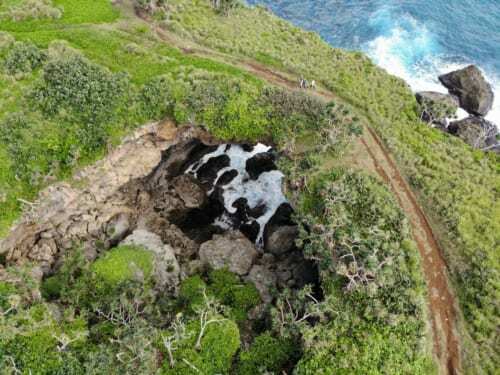 You can see that part of the cliff has been eroded by waves and a bridge like structure remains. Translating the name into English, this place seems to be called the Pigeon’s gate. Depending on your viewpoint, it could be considered a gate.Depending on your viewpoint, it could be considered a gate. 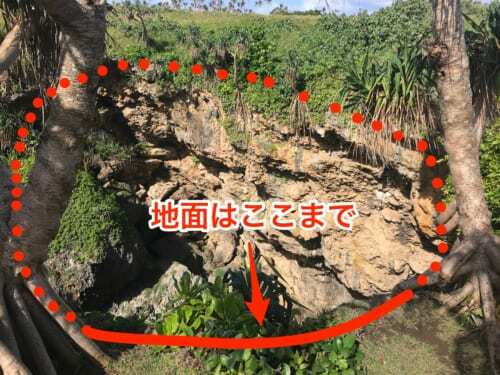 Looking from this view point it seems like there’s a hole under the cliff. 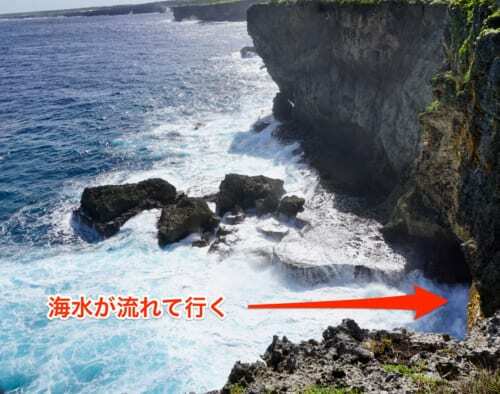 Here the water flows into the gate of the cliff. Using a drone, I was able to shoot Hufangalupe from directly above. It’s an amazing sight, something that can’t be seen anywhere in Japan. 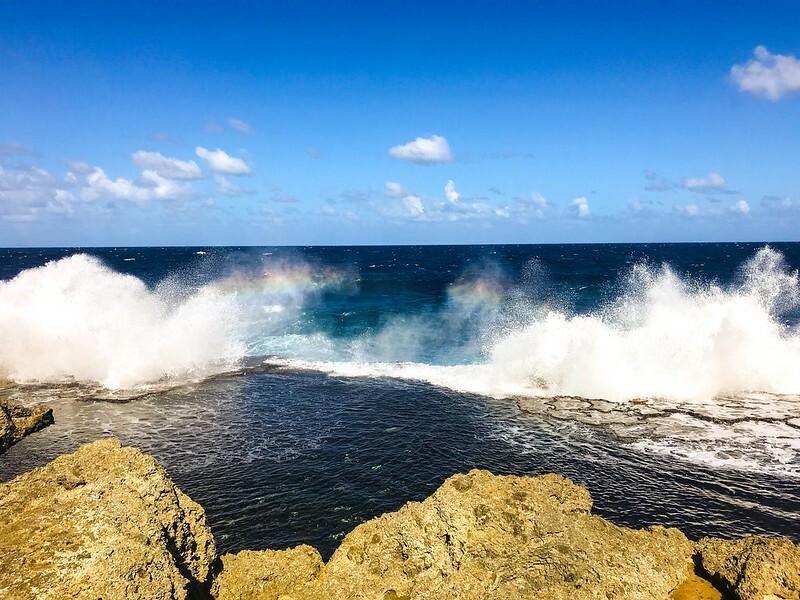 I was keenly aware of the power of the natural forces that created this spot. Note that Hafangalpe has no fences etc., so please be careful when you visit. It’s a place where you see a beautiful view and get a bit of a thrill at the same time. 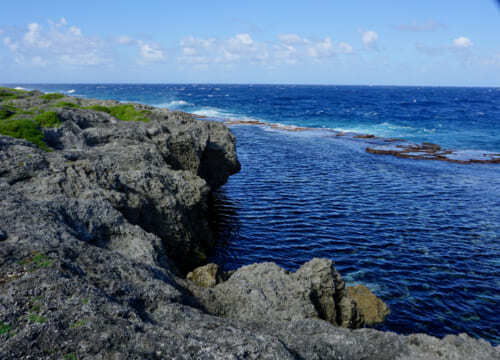 As on other Polynesian islands, Tonga has plenty of resorts and marine sports activities. 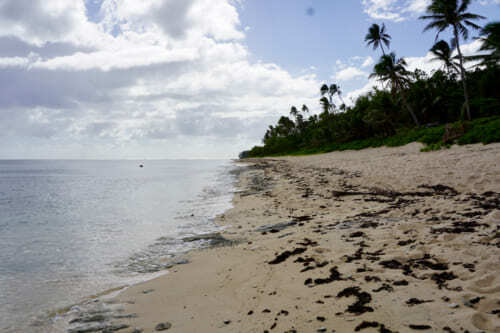 If you are interested in such, Ha’atafu Beach is a beautiful beach, and very popular with surfers. 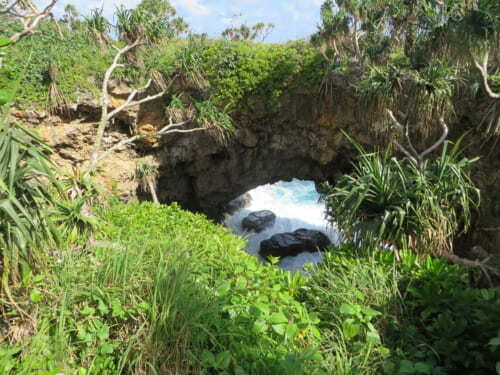 I went to Kanokupolu Beach, which is near Ha’atafu Beach. 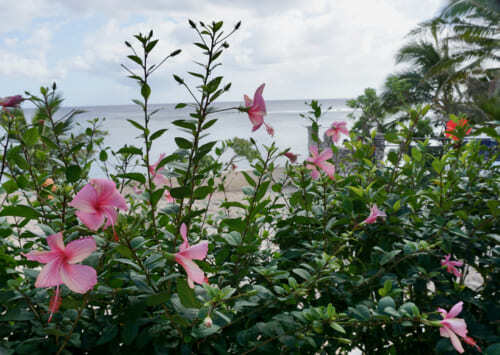 I was welcomed by brilliant Hibiscus flowers. 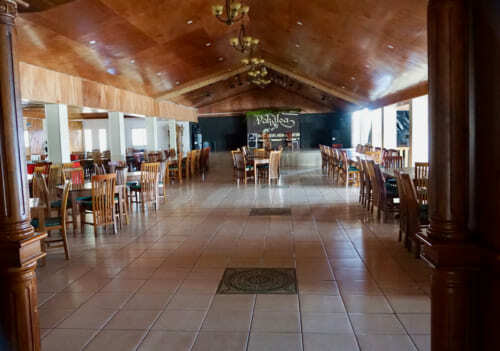 Kanokupolu has an accommodation facility called the Vakaloa Beach Resort, but it seemed deserted when I went to check it out. Well, let’s go straight to the beach. A lot of clouds, sadly, but the white sand beaches are gorgeous. 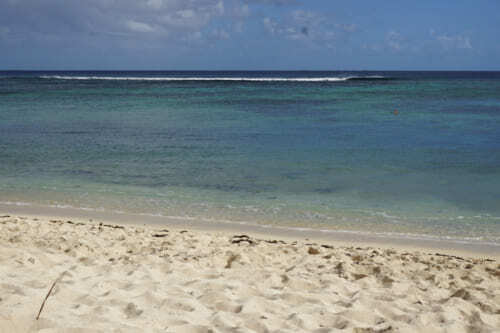 Some people were snorkeling in the distance, but it seemed like my own private beach. 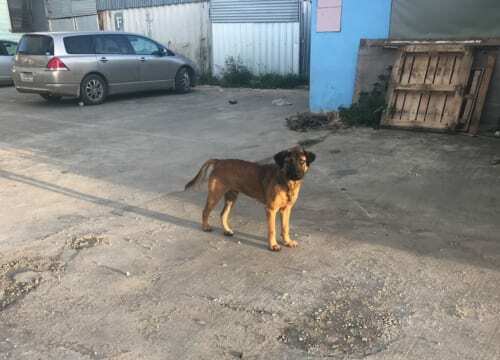 I discovered a dog who also seemed to be on vacation. Where did you come from? When the sun came out, I went under the shade of the trees. How relaxing. 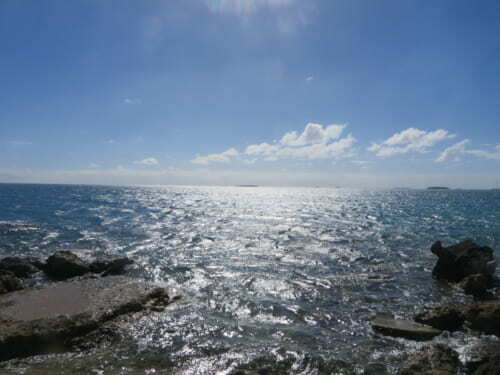 There were no crowds of beach goers, and it was a great place to fully unwind both in mind and body. 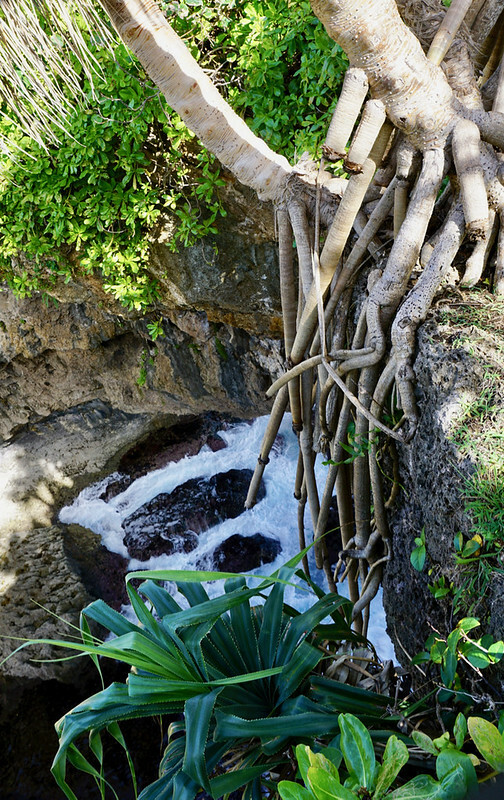 I can pretty much guarantee that you’ll have a leisurely vacation here. 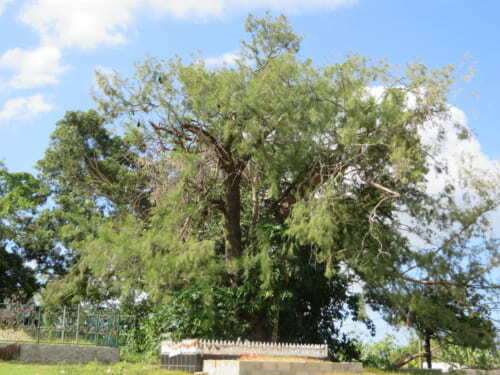 There is a Flying Fox Sanctuary located in an area called Kolovai near Kanokupolu. 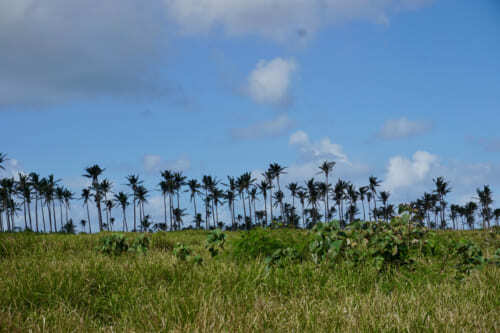 Relying on the map, I find a vacant field with a big tree. The area is fenced-in. 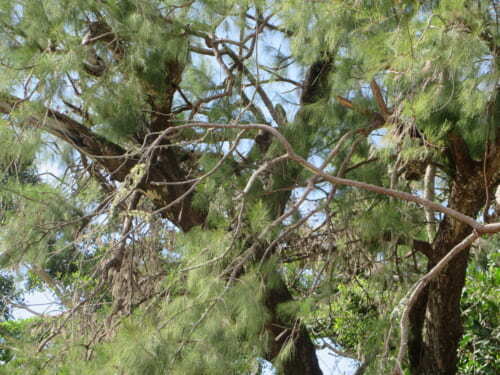 Obviously, some objects are hanging suspended in the tree. 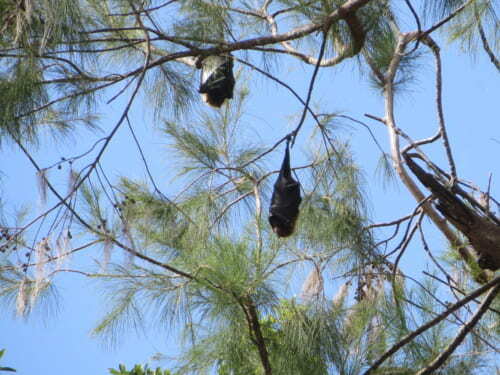 These are flying foxes. Zoom-in more. They are having a peaceful sleep. They are very big, more than 2-meter wing spans, but they only eat fruit (thank goodness.) 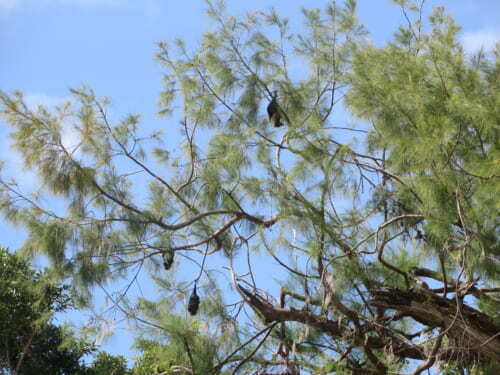 For that reason, they are also called fruit bats. Around Oceania, Palau etc. they are considered a food source. 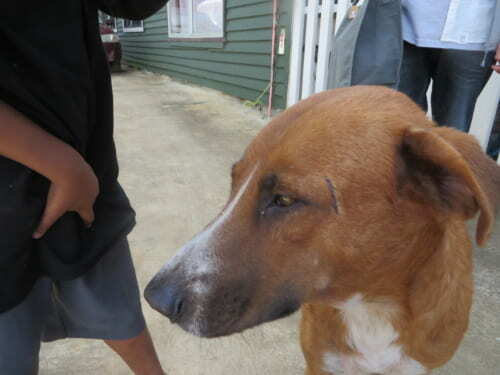 However, because in Tonga they are considered a sacred animal, these reserves are set up. 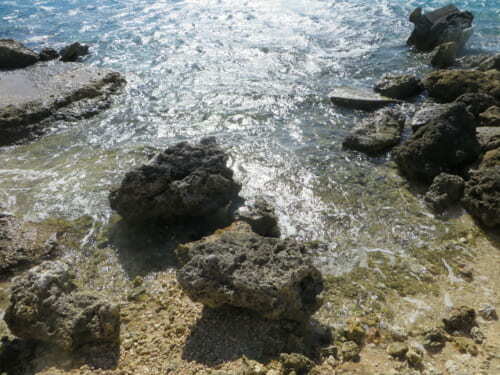 The island of Tongatapu is not so big, but sightseeing on foot is difficult. This time, I made an arrangement with a taxi driver named Mr. Lata to see different places on the island. Here is Mr. Lata who is rocking an EPSON polo shirt. He’s a bit shy and doesn’t want me to take his picture. 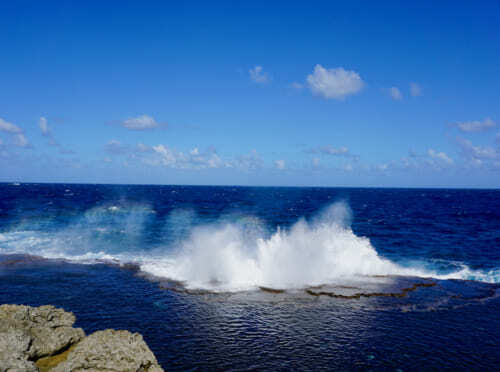 At the “Blowholes” on the south coast of the island, we can see sea water being blown through a vent hole in the limestone rocks. The water column reaches up to 20 meters and is very impressive. 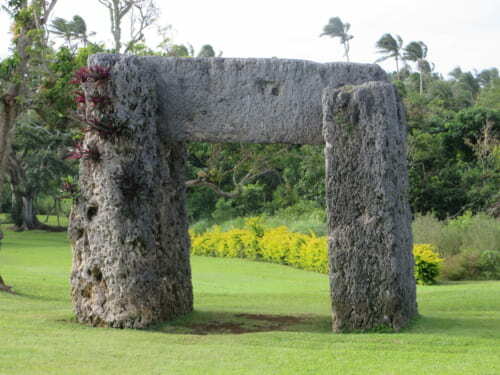 On the east side of Niutoua, you can see the ancient Polynesian ruins of Ha’amonga ‘a Maui, build around 1200 CE. A fence is set up around the area, making it park-like. Unfortunately, it was Sunday, so the ruins were closed. 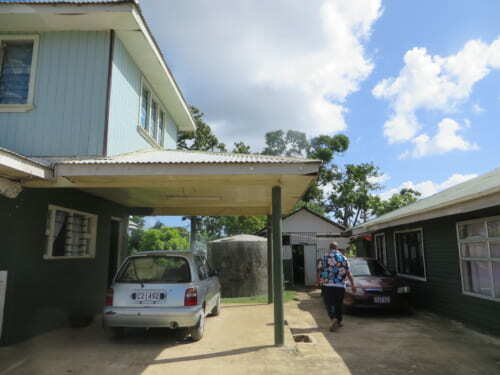 Many of the people living in Tonga believe in Christianity, and Sunday is said to be the “Sabbath”. 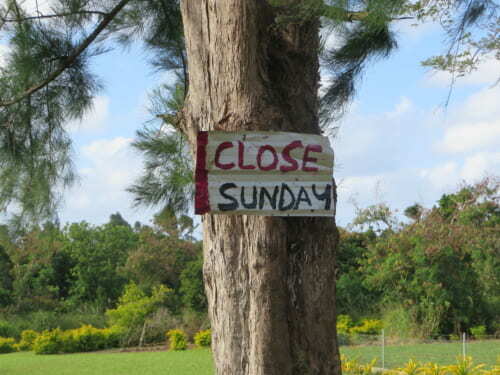 Therefore, with a few exceptions, most small shops and restaurants are closed on Sunday. 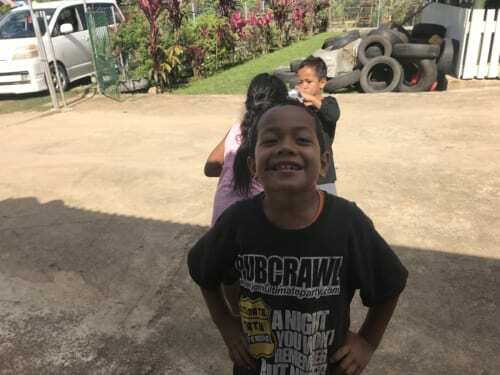 I recall that there used to be Tongan wrestlers in some sumo stables, but there was some trouble over cultural differences such as the Sabbath. The taxi stopped along the coast near the ruins. Mr. Lata says there are “Fishing pigs” here. So, I get out of the car, and see a dog catching something in the tidal pool… wait, not a dog! There were real, genuine, fishing pigs. 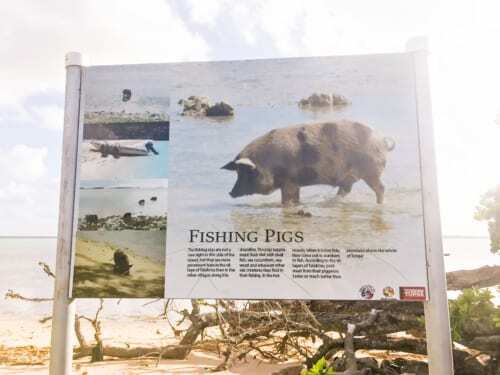 Nearby, I found a sign about the “Fishing Pigs”. 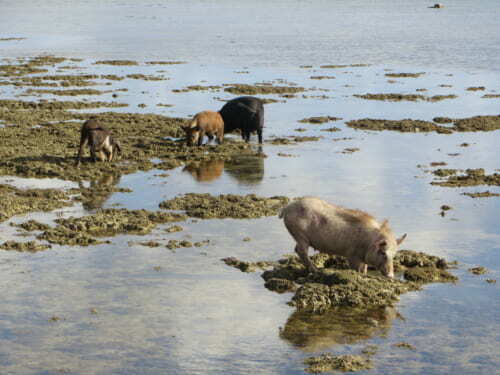 Apparently, they eat shellfish and seaweed etc. 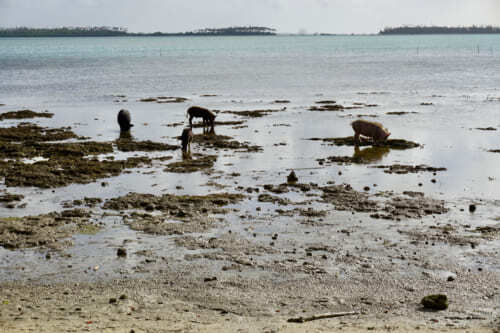 Many people in Tonga keep pigs, so this is an ordinary sight for them. Pigs raised this way will be roasted whole for the Sabbath. 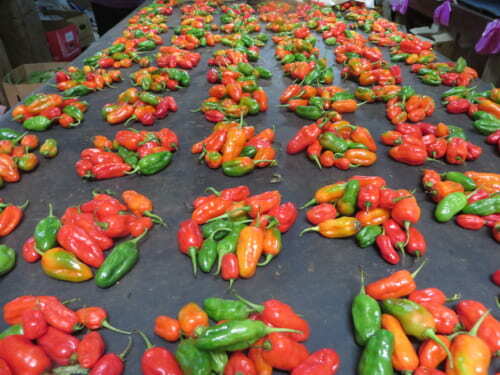 There’s no taste in the portions without skin, and they are a bit rubbery so watch out. After leaving the city center, I see many plants with similar leaves. 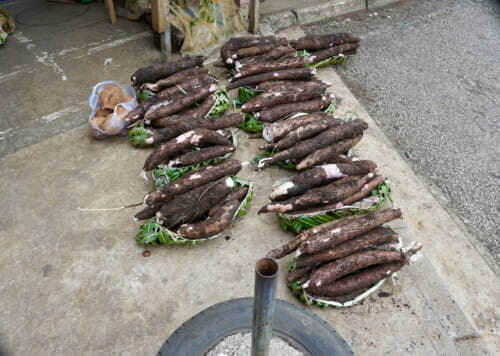 This is a plant of the Taro family, like yams. 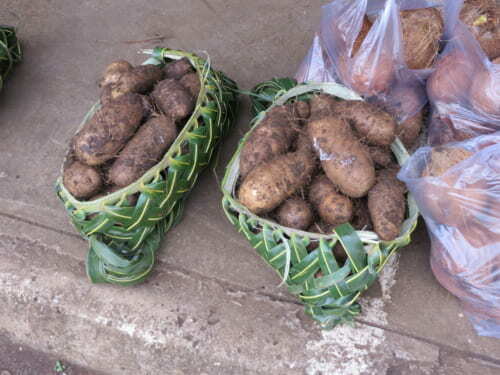 In Tonga, this kind of potato is a staple food. The leaves are big and they look healthy. Along the way, we stop at a house. I was confused because this was not in the schedule, but Mr. Lata says: “It’s my house!” I want to learn how to be spontaneous like this. He got out of the taxi and went into the house. After stealing my bottles of water – Look at that face! The three kids of the Lata family, …a naughty gang. It seemed to me that he looked like Takashi Okamura (Japanese comedian) so I shouted “Okamura-kun!”, and he said Okamura!” while turning and laughing. Maybe he thought it was some kind of Japanese greeting. It seems they don’t know much about Japan. The dog looks exhausted, being teased by these mischievous kids all day, every day. Meanwhile, Mr. Lata returned and invited me to have lunch in his home. 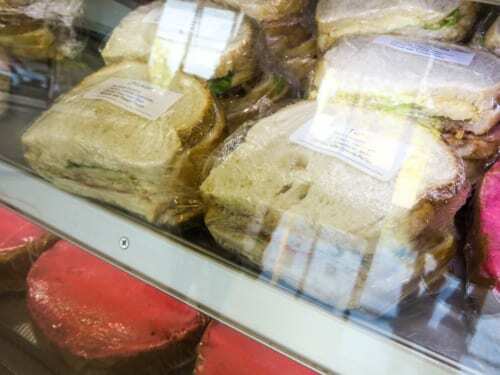 Three items for today’s lunch. 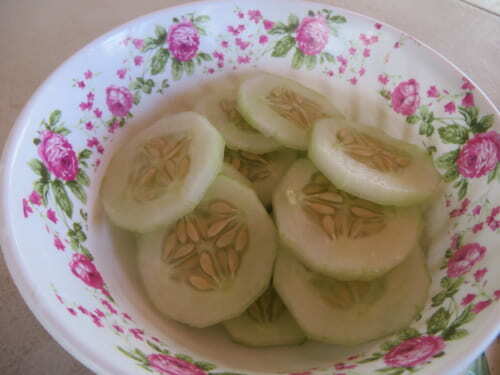 First, cucumber slices. They were just plain, but they didn’t have that grassy vegetable smell. Since the kids were playing and putting them on their faces, I couldn’t dismiss the thought that maybe they were in fact, originally for a cucumber facial mask. 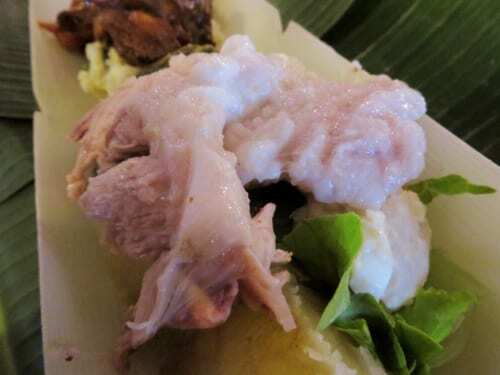 Next, a steamed dish of salted pork wrapped in yam leaves. 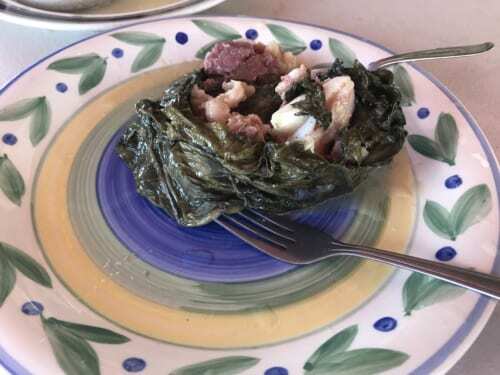 In Oceania there a traditional style of cooking called “Umu” (earth oven cooking) and this dish seemed to have its origins there. 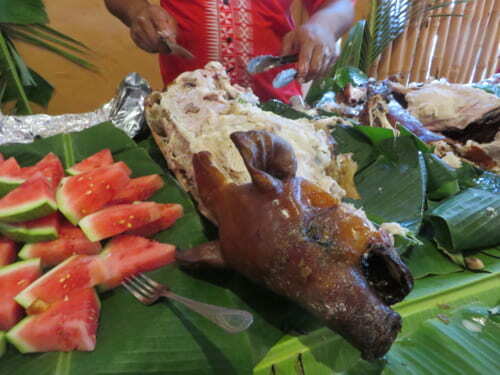 Although it was simple, I could enjoy the flavor and texture of the pork. Lastly, a cream chowder using locally harvested shellfish. 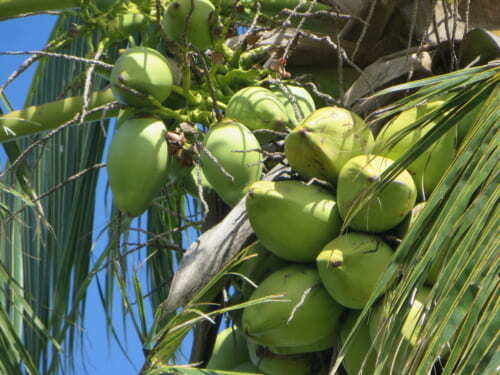 It’s made with coconut milk, so the distinctive ethnic flavor comes through. 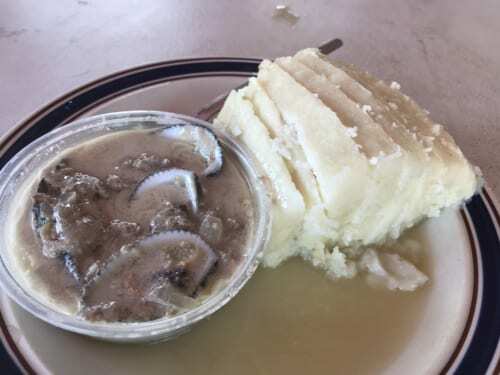 It’s the Lata family way to eat this chowder garnished with steamed yam. 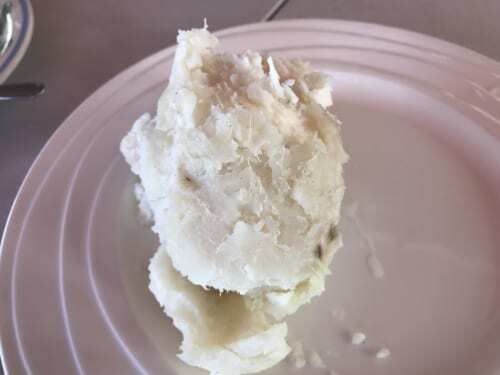 The yam has a kind of natural earthiness followed by a slightly sweet aftertaste. Mashed taros made an appearance as well. They make your stomach puff out a little quicker than white rice. It was a delicious meal. With Mr. Lata’s help I was able to visit various places around the island, and have this wonderful experience of tasting real home cooking. Many thanks to Mr. Lata and his family. Although Wi-Fi rental services for going overseas are on the rise, certain areas are not covered. 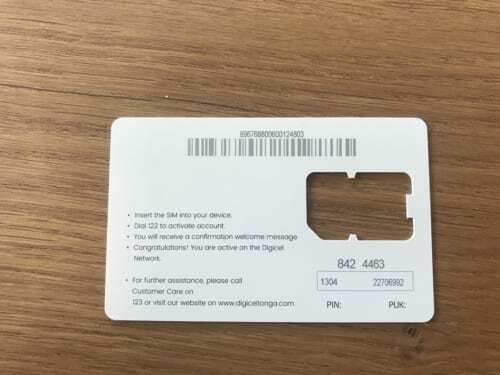 When that happens, you can buy a local SIM. 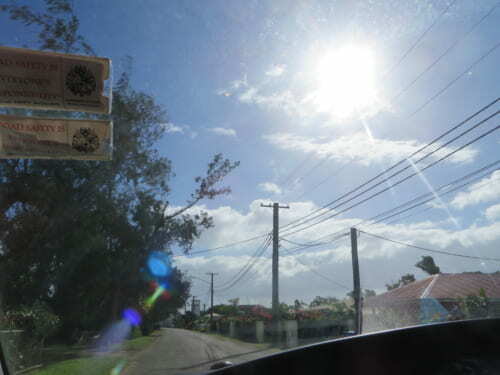 This time, I decided to conduct a little investigation in Tonga. 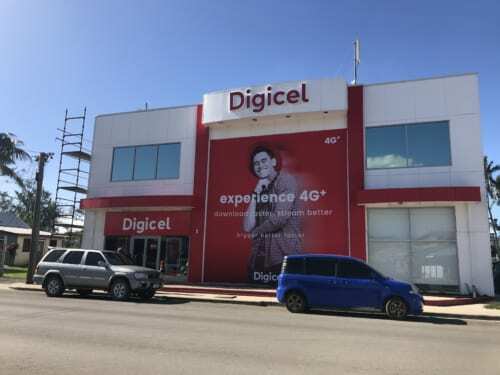 In Tonga, communications companies; “Digicel” and ”UCall” seem to be popular, and both can be found at the Fua’amotu International Airport. 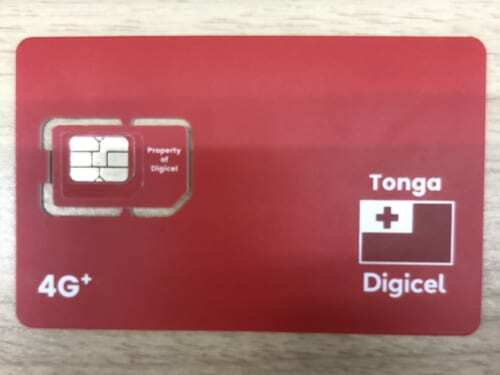 This time, I decided to check out “Digicel”, the same company I tried in Samoa. 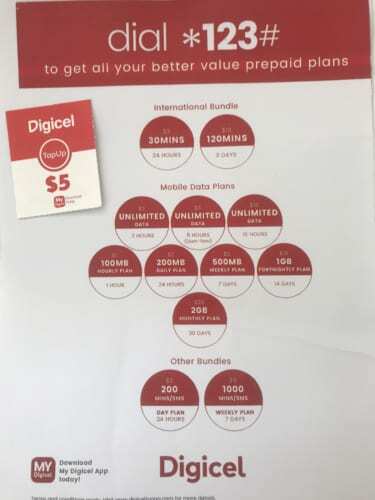 Digicel has big store in town as well. 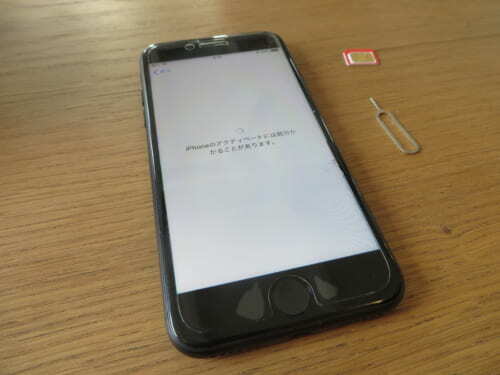 After taking the SIM out of the package and then putting it into my smartphone, I had to change the settings according to the instructions on the back. It was a bit of a pain to have to activate it by calling “122”. Right away, I tried using it in Nukuʻalofa (the capital.) It felt pretty speedy and there was no problem searching the web. 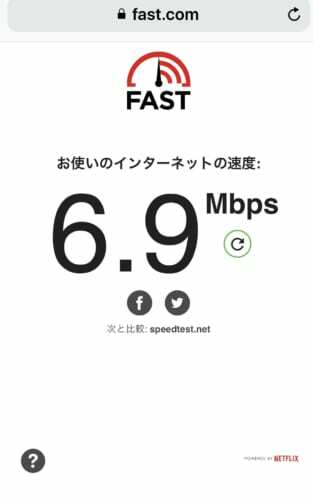 Actually, I measured the speed at an Internet Speed Test site (Fast.com). The internet speed suddenly dropped drastically, making it virtually unusable. 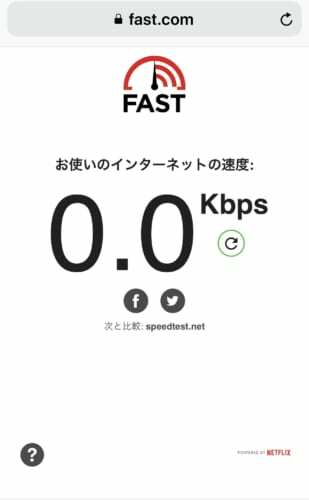 The same situation persisted and it was difficult to use the internet comfortably. 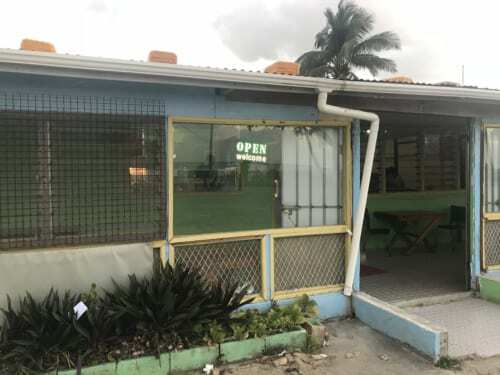 The conclusion of my investigation is that it seems “Digicel” has problems with stability that make it difficult to use depending on the location. 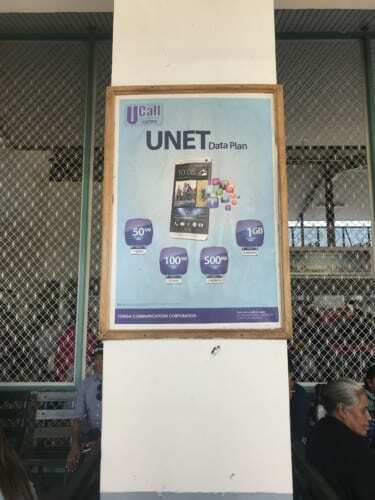 I wasn’t able to try “UCall” but maybe it’s better. By all means, give it a try. With the local SIM card not working as expected, and the hotel Wi-Fi unusable too, it looks like I am a full-fledged net refugee. 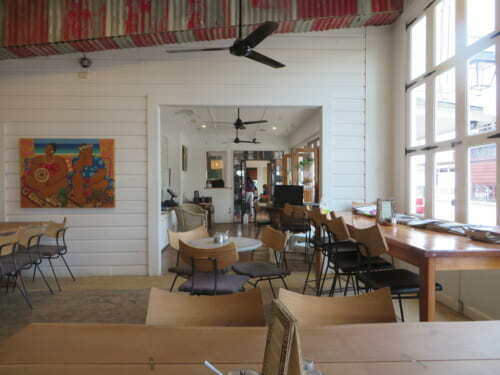 At such a difficult time, I discovered a cafe in Nukuʻalofa where I can use the internet. As my situation was somewhat desperate, I went there early in the morning. 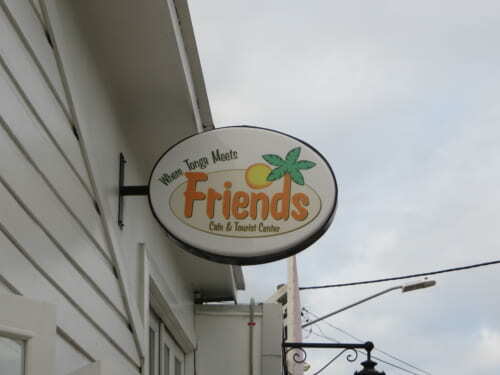 At this cafe, called the “Friends Cafe” you can use their Free Wi-Fi. The interior is done in muted tones and the atmosphere makes me feel as if I were somewhere in Europe. 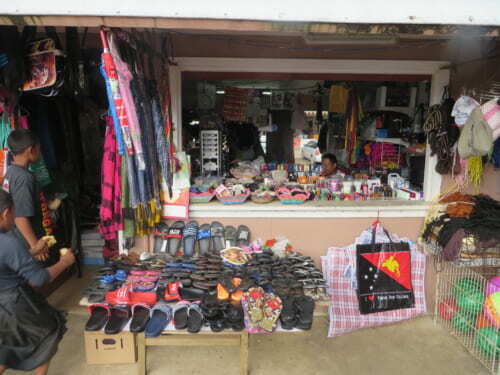 At the back of the shop there is also a souvenir corner set up. It seemed they have a breakfast menu, so I decided eat here too. 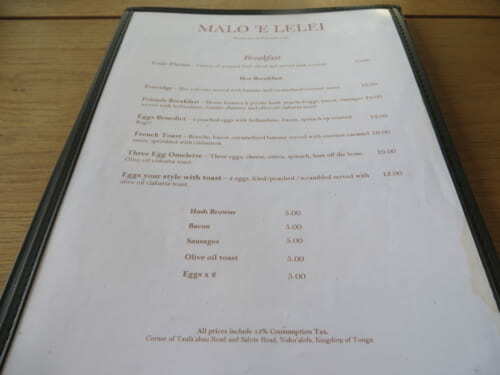 By the way, “MALO ‘E LELEI” written at the top of the menu means “Hello” in the Tongan language. I made my order, and sat back with high expectations for net surfing while eating. 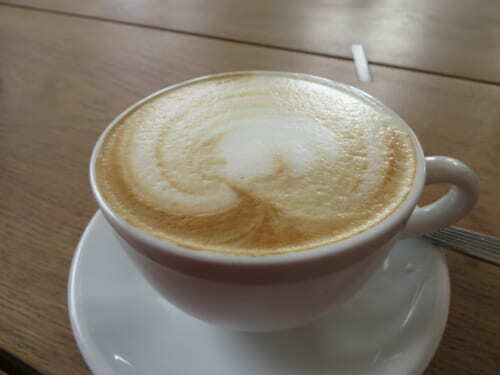 A regular sized cafe latte, which came out immediately, was 5 T$ (about 280 Yen.) Matching fragrant espresso with foamed milk using a special machine is something all the world universally loves. Next, my breakfast plate. 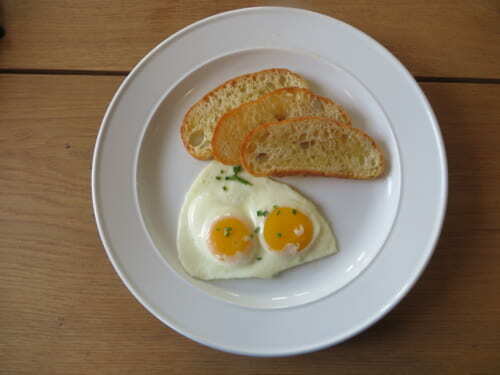 Two fried eggs with ciabatta toast topped in olive oil was 13 T$ (about 730 Yen.) Ciabatta is a bread that comes from Italy, so I felt that special attention was taken with this menu. All set with breakfast, I finally proceed with the internet connection ceremony. I told the clerk “I’d like to use the Wi-Fi”, so they gave me a receipt. 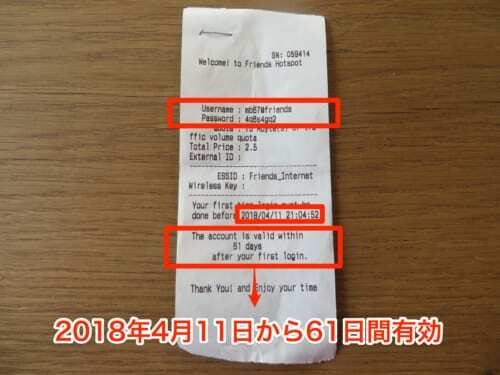 The receipt has connection information such as the user name etc. I select the target ESSID from my smartphone settings and enter the password… but it doesn’t connect. Looking closely, I found that this connection information is valid for 61 days from April 11th, 2018. This date is no longer valid. So, I notified the clerk about the situation, and received a new receipt with a valid date. However, it still wouldn’t connect. So, I couldn’t use the internet after all… All this searching for what can’t be found, no net surfing for me, but I will quietly look at my smartphone anyways. 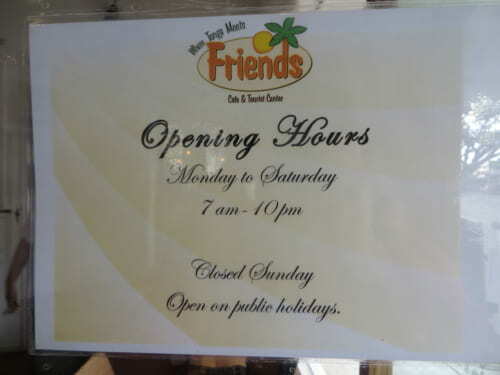 Note that the “Friends Cafe” is open from Monday to Saturday from 7:00 am to 22:00 pm. Net refugee or not, this is still the best place to take a break. In spite of not being able to surf the net, I enjoyed a peaceful morning with a delicious breakfast. 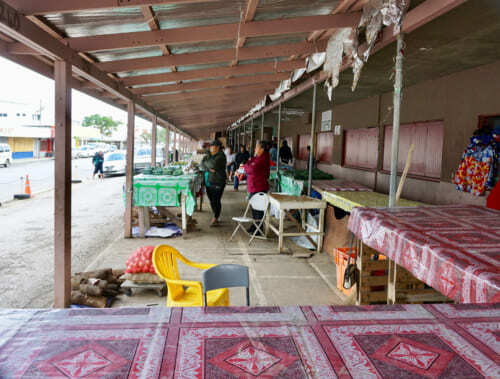 The Talamahu Market opens on Monday mornings. 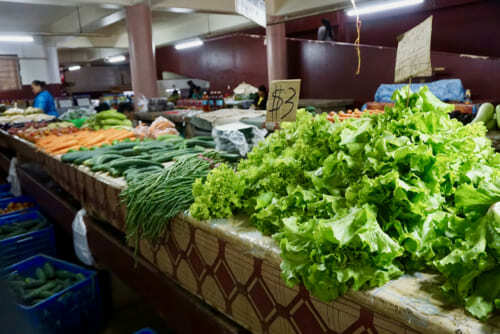 Here they sell only vegetables and fruit, and this is where you can buy locally grown produce. Staples like potatoes. The thinner ones look like Japanese yams. Colorful chili peppers and cucumbers bigger than zucchini. 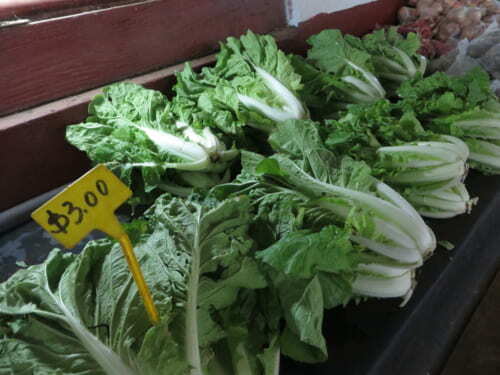 Chinese cabbage is about 170 Japanese Yen. 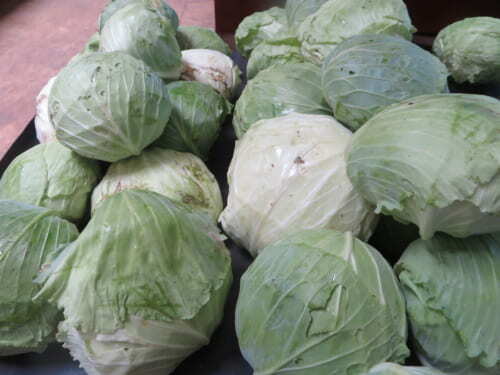 Nice looking cabbages as well. 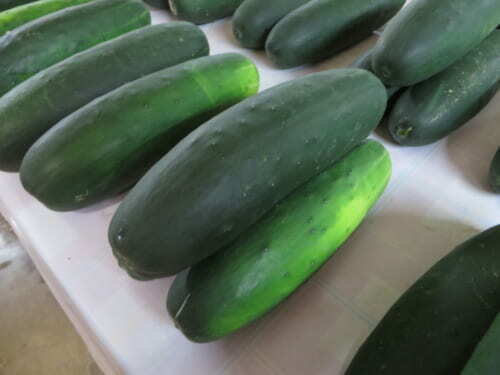 More familiarly sized vegetable were also on sale. 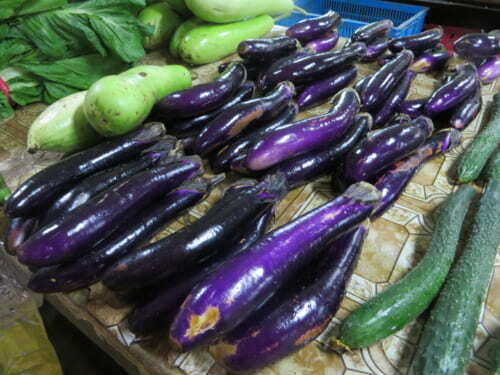 Eggplant (per bundle), also about 170 Japanese Yen. 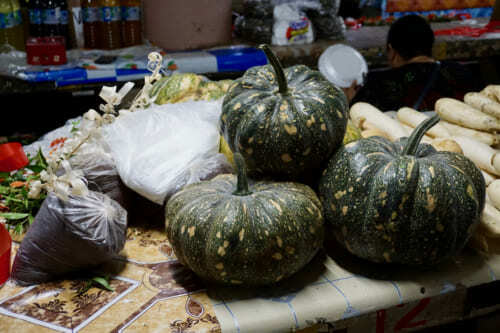 In one corner of the market, I found Kabocha squash. 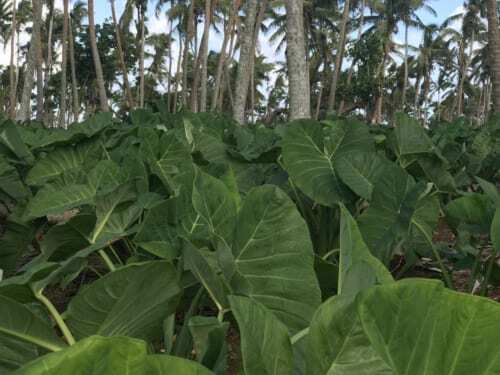 It seems that in Tonga there was no custom for eating Kabocha, but some Japanese companies thought that the climate would be suitable and imported the seeds, now they are very common. 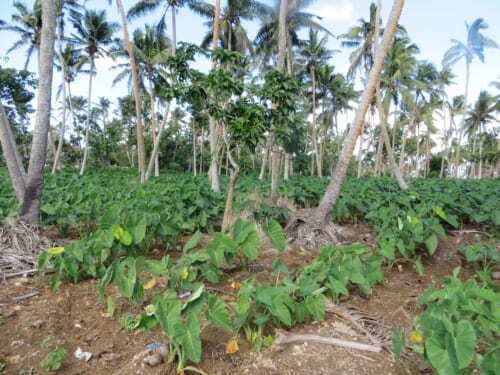 In fact, Wikipedia says that Kabocha squash exports are now a pillar of the Tongan economy. So next time you buy squash, check if it came from Tonga. 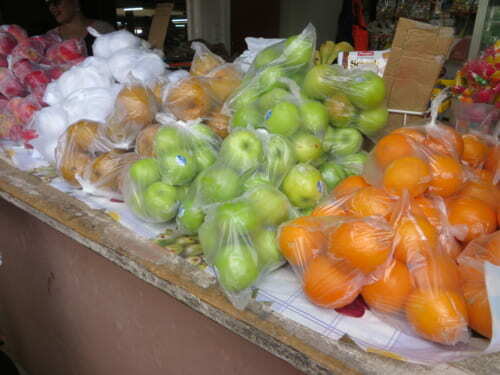 I’m not sure if these were grown in Tonga, but apples and oranges and other fruits were also sold in the market. 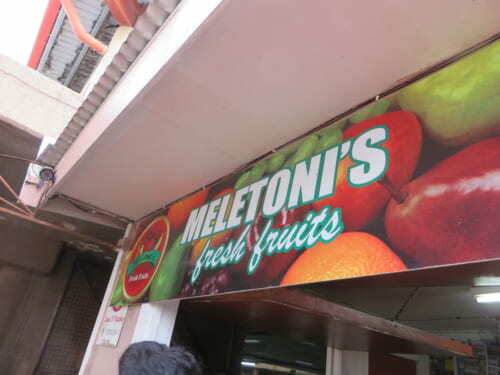 Outside there’s a shop that can make juice from your favorite fruit. 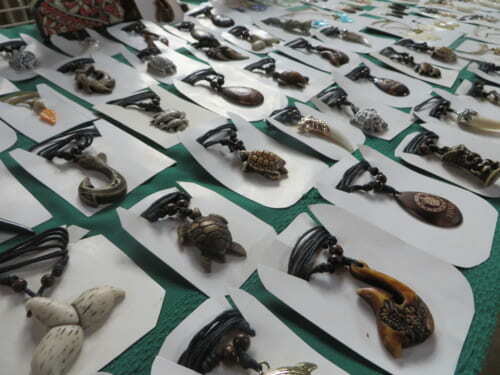 Local crafts corner. It seems like a good place to buy souvenirs. 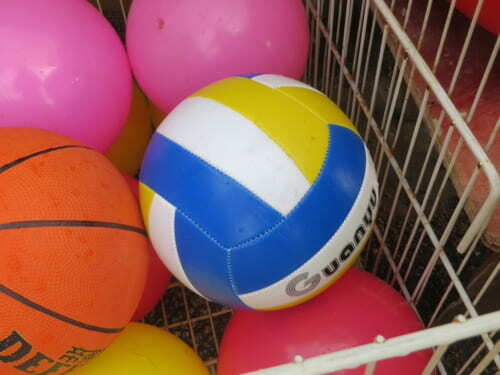 I discovered volleyballs that remind me of “MIKASA.” No need to worry, if you suddenly feel a desperate urge to play volleyball, you can buy a ball here. Lots of clothes available. After mentioning Kabocha, Wikipedia goes on to say that the minimum size of women’s shoes in Tonga is 26 cm. However, there are in fact all kinds of sizes on sale. 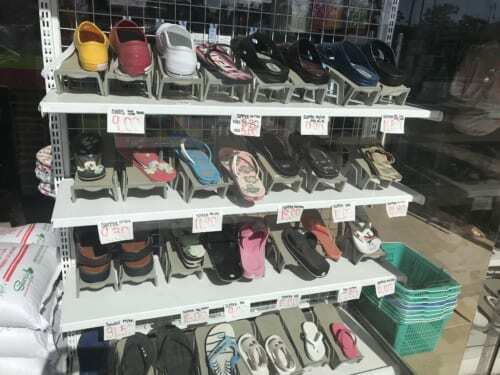 There was a good selection of sandals, in the Polynesian style of course. 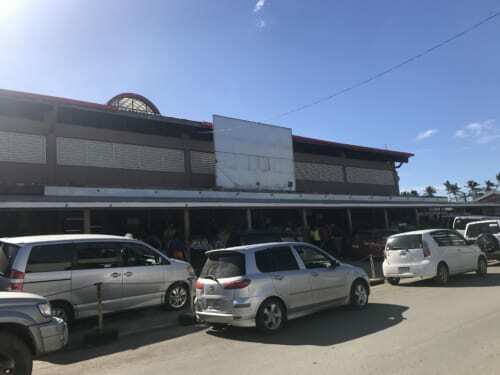 The Talamahu market did not sell meat and fish, but it was nice and had almost all the daily necessities you could. Stop by if you are in the area sightseeing. 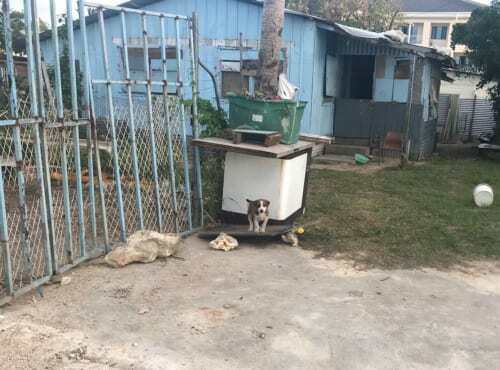 I saw a lot of dogs on this island; I’m not sure if they are all escaped pets or if they just have a freestyle way of keeping dogs. 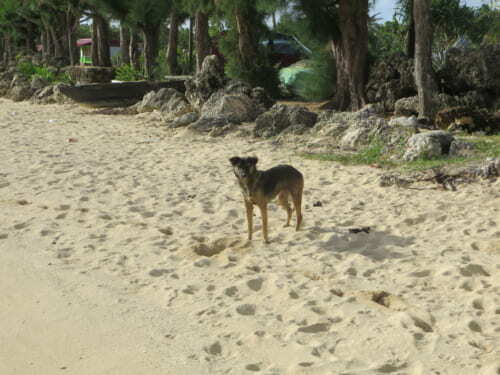 Of the islands I have visited so far; the dog encounter rate has been the highest here. So, I’ll present a few of the times they made an appearance. 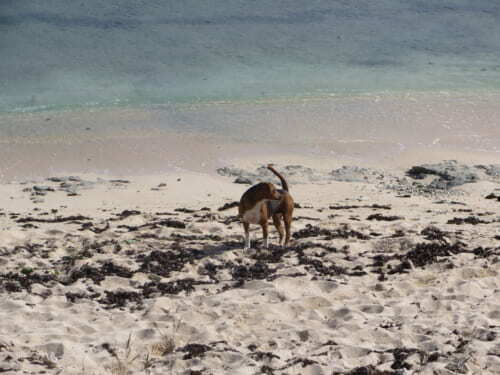 First, doggy on the beach. Finally, sunset doggy. 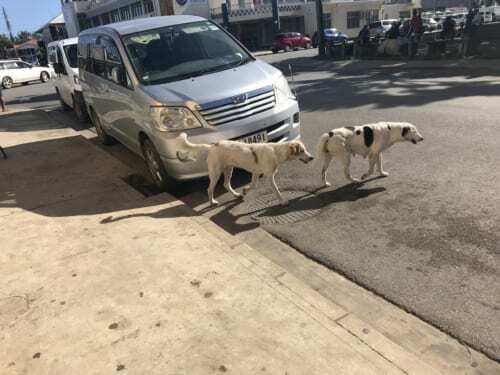 In town, dogs often jump out onto the road. And if you meet one in the dark of night on a lonely road, you might feel nervous, so be careful. 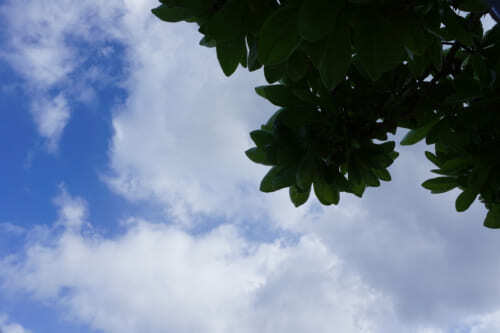 The weather is nice, comfortable in the morning. 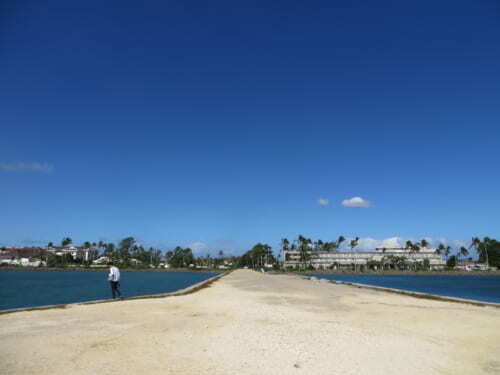 I decided to walk around Nukuʻalofa a bit. Salote Road. There are many houses and its pretty quiet (I can hear a dog bark). 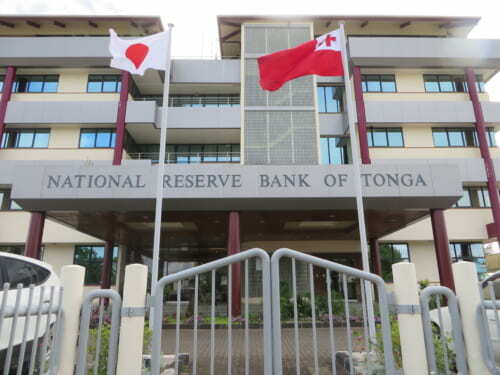 At the National Reserve Bank of Tonga, I found Japanese flag. 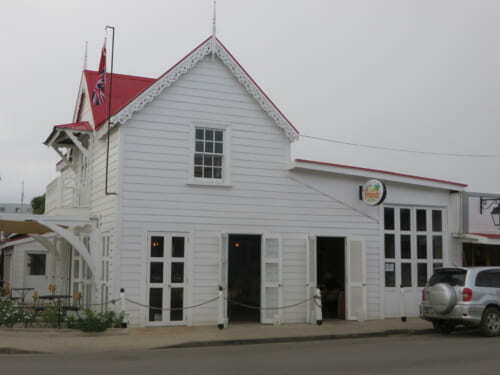 The Japanese Embassy of Tonga seems to be in this building. 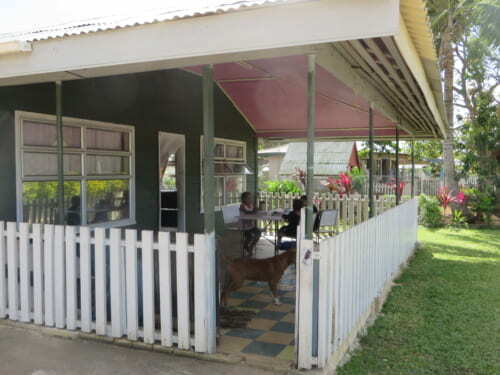 However, because of the bank the security was pretty tight, so I couldn’t go in and check it out like in Samoa. 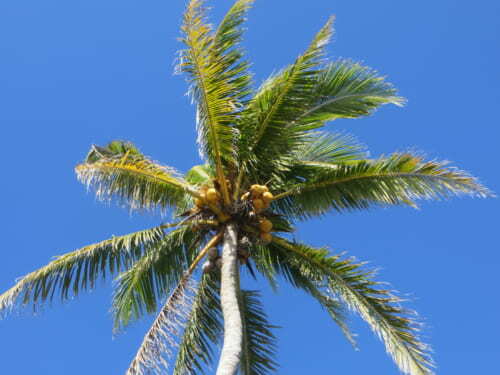 As a tropical country, Tonga has a lot of coconut trees (palm trees). Even though the weather was nice, it was a little chilly, I couldn’t go without my jacket. Going to a pier called the “American Wharf.” At the end of the pier, there were some young couples, or people alone listening to music etc. It seems to be a bit of an oasis for the people living nearby. 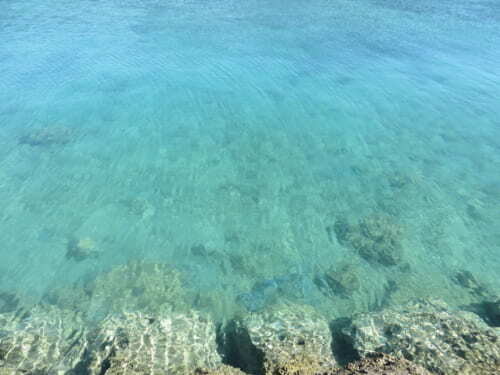 The clarity of the water was amazing, I could see the fish swimming around. On Takaunove Road. There’s a large parabolic antenna set up. It may be communicating with the Arecibo Observatory. 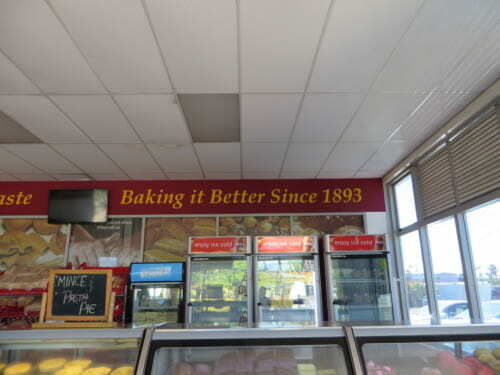 In the shop, there were many locals stopping by, as well as tourist and workers that came in to buy bread. 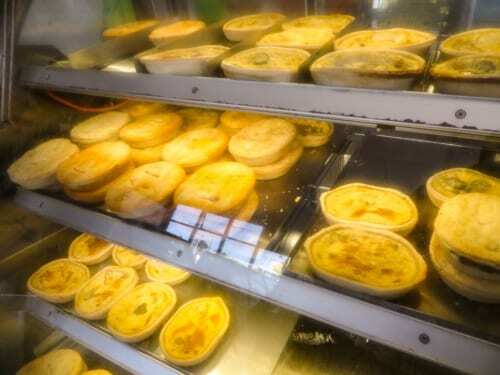 Handmade sandwiches and pies lined up under the glass. 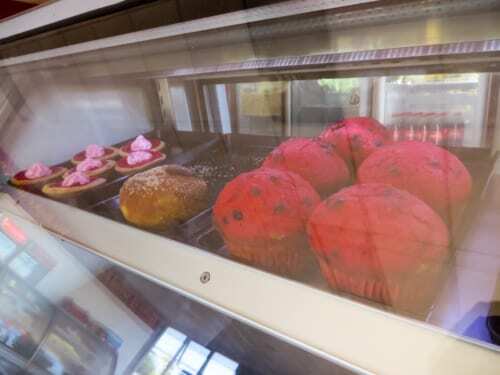 There was also an abundance of sweets, like doughnuts and muffins etc. 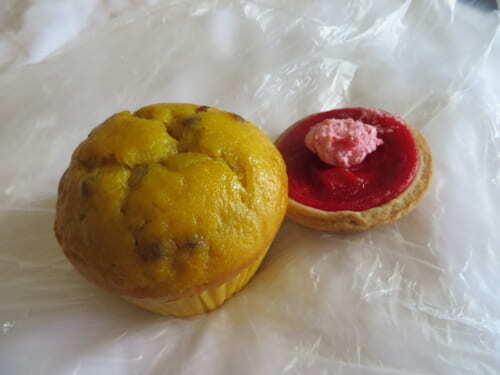 Torn over all the temping choices, in the end I bought an Earl Grey muffin and a berry tart. The texture of the muffin was very moist. Although the tart was small, it had a lot of berry sauce and the taste was outstanding. They were both fairly sweet, maybe this is the preference of the King. Both together were 3.5 T$ (about 200 Yen). 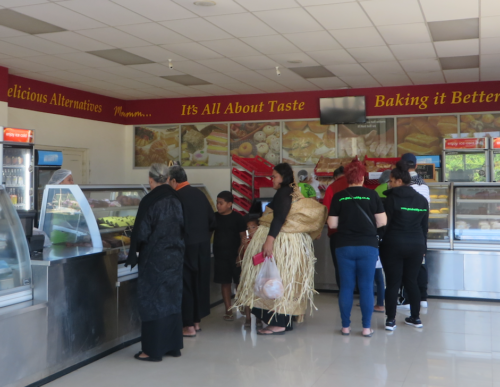 One of the few restaurants open on Sunday is the “Kimiko Chinese Restaurant”, located on Vuna Road. I went before business hours and the place had a sort of abandoned feel to it. 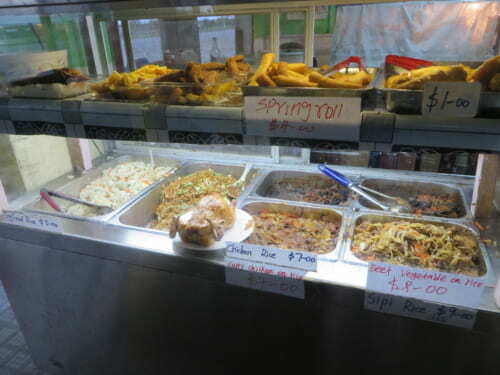 When its open you can order from the menu at the cashier, or from the dishes under the glass. I decided to try the fried rice and yakisoba, and some mysterious deep-fried food. 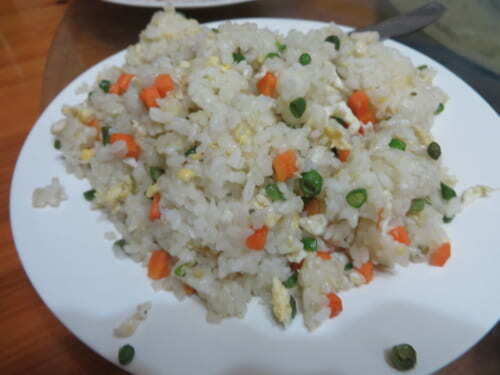 It’s fair to say that fried rice is my standard order on the domain island tour (this one was approx. 280 Yen). 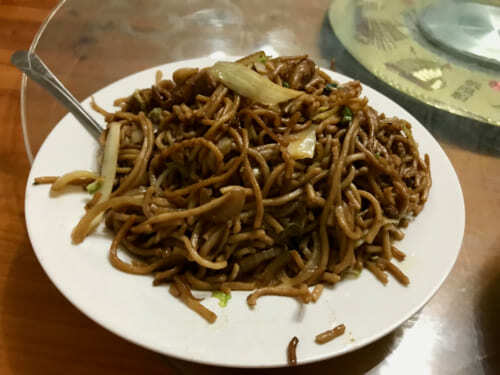 The yakisoba seems a bit drowned in oil and oyster sauce, some people might have a hard time getting it all down (approx. 450 Yen). Here is the mysterious deep-fried food. 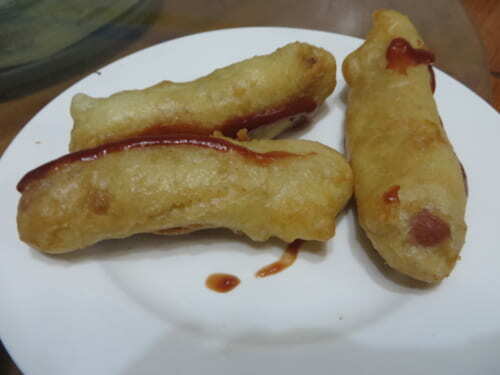 When I tried it, it turned out to be some kind of sausage fried in batter, a sort of American hot-dog type of food (per hot-dog approx. 60 Yen). The clerk serving ketchup took pride in their work. 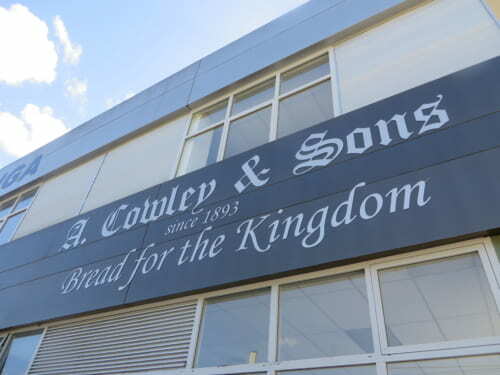 Its open from 9:00 am to 21:00 pm every day, so no problem to visit on the Sabbath. However, I was satisfied with going once, I didn’t go again during my stay. 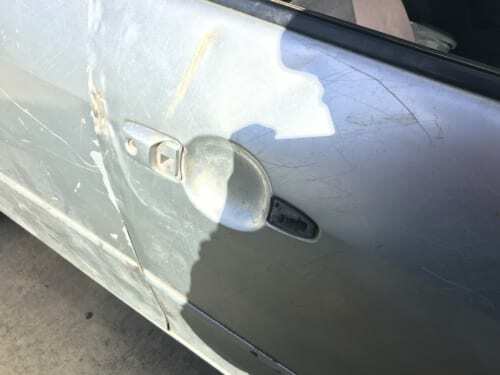 Besides this, I saw cars without door handles, and DVD shops that I couldn’t tell whether they were open or not. There were a few shops that sold everyday items, but the assortment was basically the same. 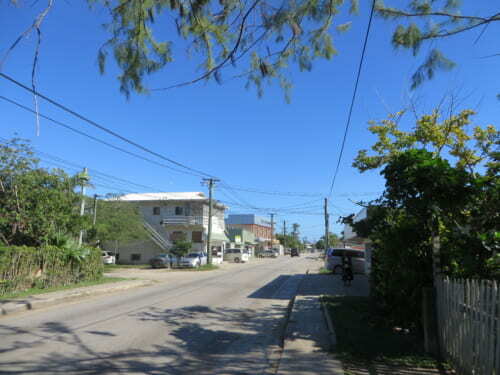 Tonga has many scenic spots, but I discovered all kinds of interesting things just by walking through the city. After making my on-site investigation, it seems that the “.to” domain is frequently used by companies that provide services for visitors, such as spas and regional airlines. A hand-written sign at a relaxation spa. 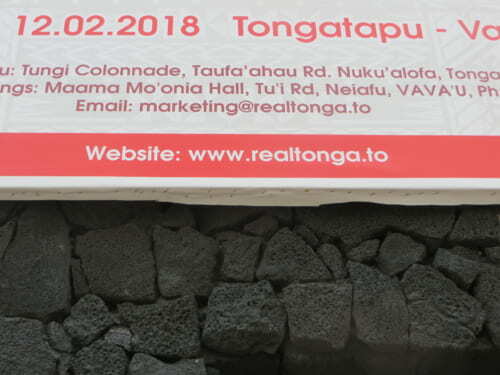 In the domain name of the “RealTonga”airline company. Domains have changed from merely being an “internet address” to being a sort of business card, expressing the contents and services of the company.In Japan, there may be a lot of recognition of the former, but I think there could be more effort to do the latter. 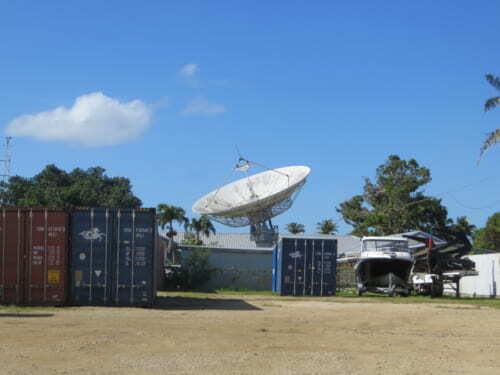 To use domain names as a sort of strong partner to convey business culture and services as is done in Tonga. 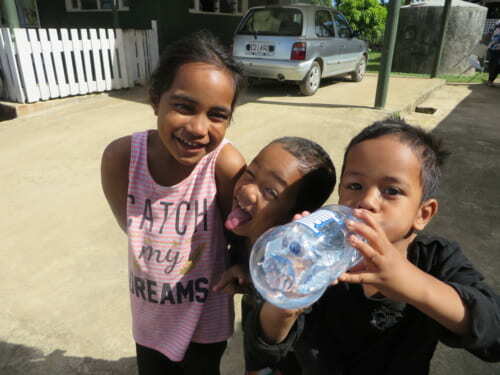 Tonga is the only Kingdom in Polynesia. It was fascinating to experience the warmth and enthusiasm of the people living there.